Good morning I reciently purchased a new computer so I started moving all of my add-ons over to the new one. I have everything for FSX setup and installed. I installed Airbus X (latest version) I updated to the latest Aerosoft Launcher. So I proceed to launch the program and start Joystick Configuration Tool so I can re-setup my throttles I go in and select everything that my old computer was setup. Seemed easy enough I go to start FSX load up the Aerosoft A320 just to double check to make sure I am good to go and as with my old computer the throttles are non-responsive. I can use the keyboard to control the throttles but that is it. I have spent hours reading threads and watching videos on how to get the throttles working correctly. I have beaten my head on the desk more times than I can count. This has been more than a PITA than it should be. My throttles work perfectly with my other aircraft PMDG NGX, PMDG 747, QS 757, Project Airbus, ect…. Aerosoft Airbus X has been the thorn in my side. I played around for another 45 min to an hour and so far nothing. I had this problem way back in the beta of the Joystick Configuration Tool and finally after a few weeks we got it working. Anyone from Aerosoft can assist I am really at a loss for words on how difficult it has been to attempt to get this working. I have 3 items listed for the Joystick Configuration Tool (CH Pro rudder pedals, PFC Yoke, and Jetmax 737 throttle quad). did you read manual Vol.7 about throttle setup? are you assigning the throttle through FSX or any other software? do you use any specfic driver for the throttle or default Windows driver? have you also reinstalled ALL Microsoft Visual C++ Redistributables? And to make sure we are talking about The Aerosoft Airbus A320/321 version 1.31? are you assigning the throttle through FSX or any other software? I tried in FSX 1st, no go then via a registered FSUIPIC No Go, and then the Joystick config tool still nothing. The best I could muster was FSUIPC but the throttles move only to reverse thrust. The best I could muster was FSUIPC but the throttles move only to reverse thrust. Did you make the correct setting in the Airbus Configurator? After following the steps in the link above NO go, so I went to the issue that caused many of us headaches. 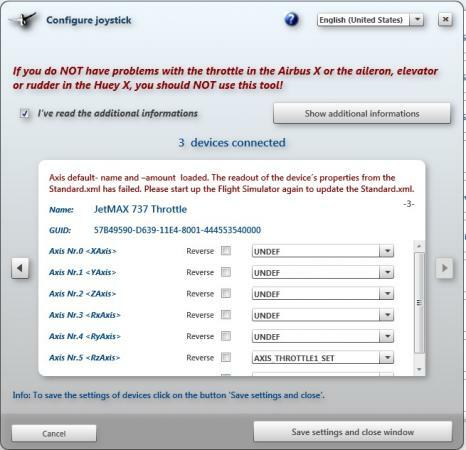 Now when I launch the Joystick Config utility it locates 3 devices (PFC Flight Yoke, CH USB Pedals, and my JetMax 737 Throttle) Now the it's telling me it cannot read the Standard.xml file under the 737 throttle. I did what it suggested and started FSX and I shut it back down same text at the top. I went ahead and assigned the throttles per the pdf you guys included still nothing. This is where I was several years ago until I was able to get it to finally work. 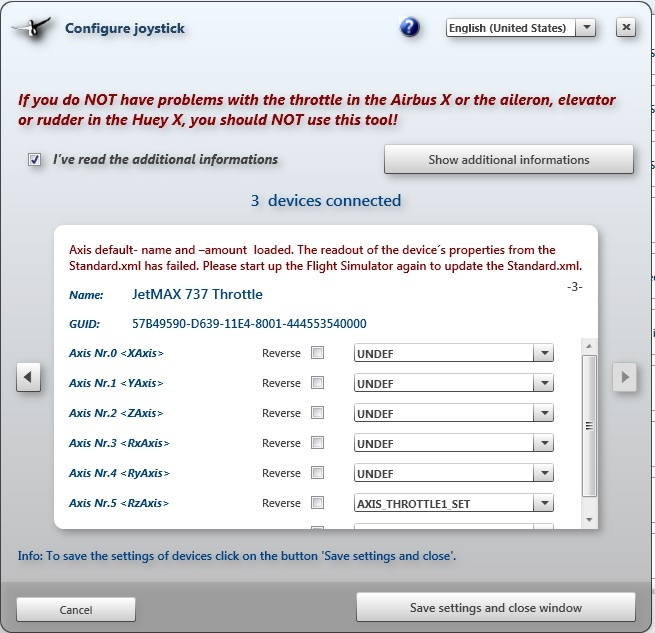 Any suggestions as I am at a total loss as to why I cannot get the Airbus X throttles to work with my throttles I was able to get them to work on my old machine. Sorry no idea about the old Airbus. But I saw that you installed under c:\Program Filex x86...., did you install everything as Administrator (right click on the setup fiel and choose run as Adminiastrator)?